Cornbread Stuffing with Bacon & Greens: Chef David Tanis, grew up in the Midwest amid the nation's heartland, and his mother's cornbread stuffing recipe passes to the next generation. With only two slight modifications from Mrs. Tanis' original recipe, this stuffing can complete your Thanksgiving or Christmas turkey. If it satisfies your family as we think it might, a new tradition may be in the offing. Remember, stuffing is not stuffing if it's not cooked inside the bird. If you want to stuff the bird, cut out 2 cups of the chicken broth. A Bacon Pro bacon cooker will help you reduce the time it takes to cook enough bacon for what's called for in the recipe, so you can concentrate on the other dishes that help make the Thanksgiving feast so memorable. Preheat the oven to 350°. Brush 2 large, shallow baking dishes with butter if you want dressing rather than stuffing. Spread the corn bread cubes on 2 large rimmed baking sheets and bake for about 30 minutes, until golden brown and crisp. Let cool. In a large saucepan of salted boiling water, cook the kale until bright green, about 1 minute. Using a slotted spoon, transfer the kale to a colander and drain. Lightly squeeze dry the kale and coarsely chop. Cook the bacon until crisp saving the drippings. In a large skillet, melt the 1 stick of butter. Add two ounces of the bacon drippings, celery, onions and crushed red pepper to the skillet. Season with salt and black pepper. Cover and cook over low heat, stirring occasionally, until the vegetables are softened, 15 minutes. Transfer the mixture to a large bowl. 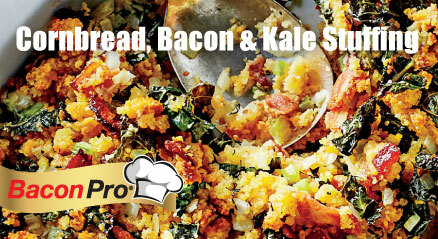 Add the kale, crumbled bacon and corn bread and gently toss to mix. In a small saucepan, melt the remaining 6 tablespoons of butter over moderate heat. In a medium bowl, lightly beat the eggs, then gradually beat in the chicken stock. Gently fold the egg and chicken stock mixture into the stuffing, then fold in the melted butter. Fill the turkey cavity with the stuffing. Or, if you want dressing, spread the stuffing in the prepared baking dishes and cover with foil. If you want dressing, reduce prep time on Thanksgiving Day by preparing the day before through Step 4, and refrigerated overnight, before baking. If you want to stuff the bird, you can still prepare the day before, but wait until the next morning to stuff the bird. Cut 2 cups of chicken stock when stuffing the bird. Another option is to prepare a bread stuffing too. That way you'll have two stuffing options for your guests. Check back with us for the bread stuffing recipe. Enjoy friends and family, and as always, bacon all around. . .